We got a new oven right before Pesah! It was really, really, really, really, really exciting. 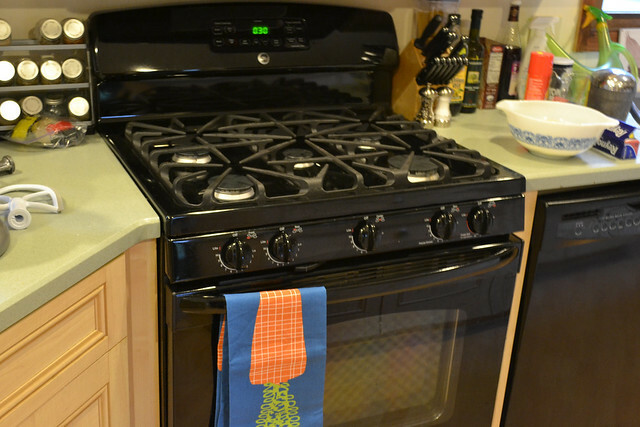 (Did I mention I was excited about my oven?) Our old oven was AWFUL. It turned off regularly whenever programmed between 350 to 375 degrees... not helpful for a challah baker, right? 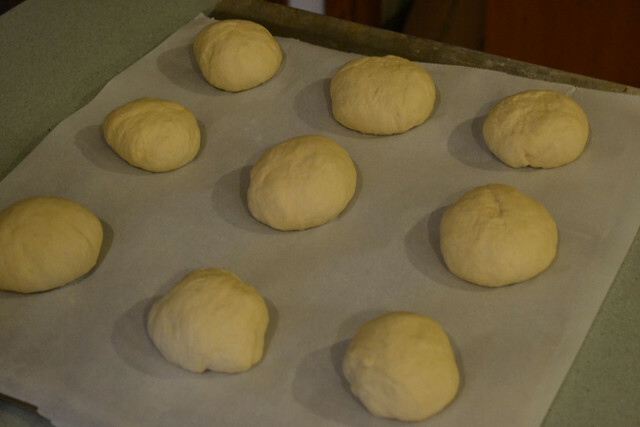 The temperatures were consistently uneven and the oven just didn't hold it's heat. But our NEW oven came right before Pesah which meant... nooooo kashering! What a relief that amongst preparing for a seder for 18 and deciding where to do my Ph.D. (!) 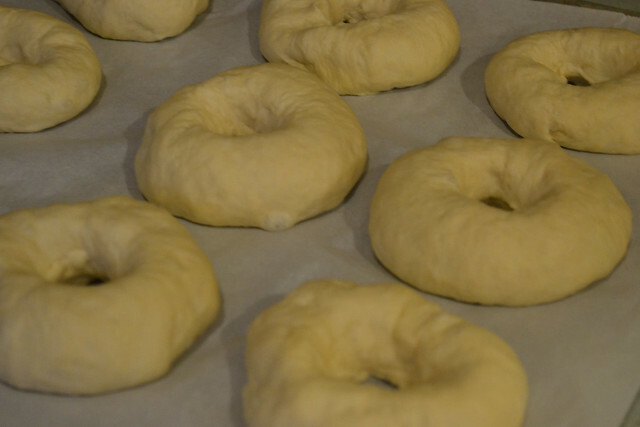 I did not have to also kasher an oven. Our new baby is pretty standard, nothing terribly fancy and really modest price-wise. But it does have a continuous grate and FIVE (count 'em!) burners which is really handy. So can I tell you how excited I was post Passover for our first bread baking! 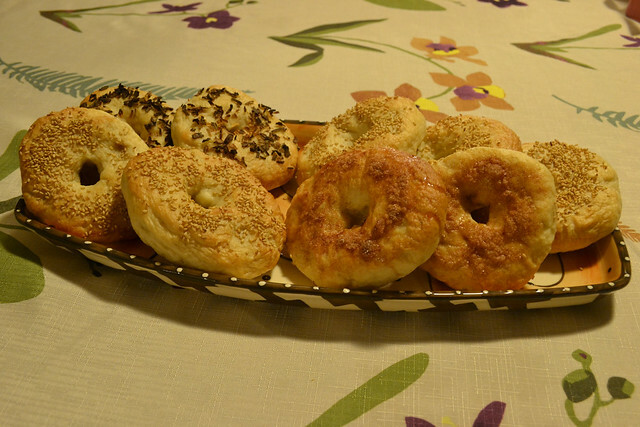 Bagels!!!! I can't take credit of this recipe. 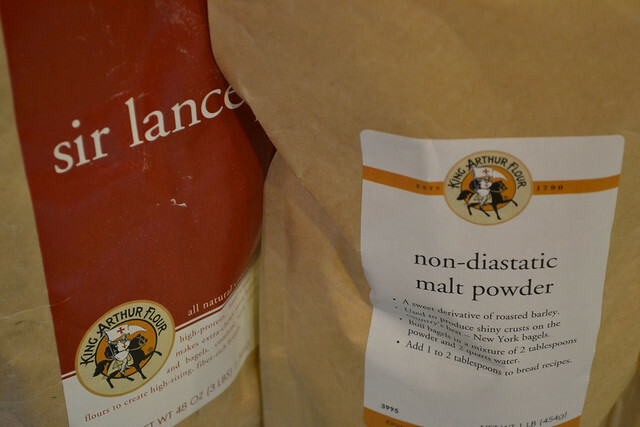 It came straight off the back of a bag of King Arthur Sir Lancelot High Gluten Flour. Here's a link to the recipe, and here are my adventures in making it! The dough is very tough. It almost feels too tough. But I just told myself to trust the recipe. Since I wasn't experimenting, it was my only option. 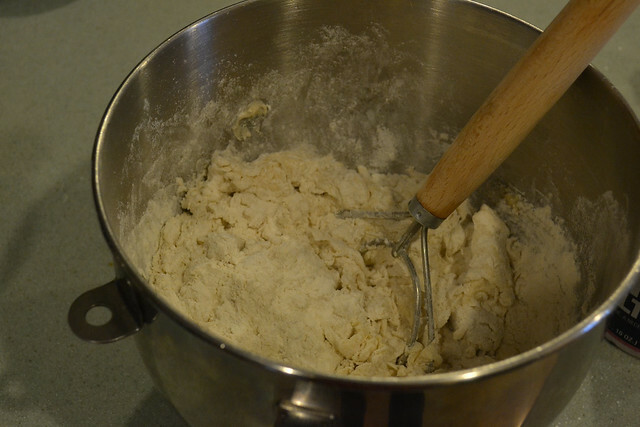 This was one of the first times we actually used instant yeast as written... just mixed it in right at the beginning. I've been proofing my instant yeast for challah (basically just treating it like active dry). Anyone have any thoughts? 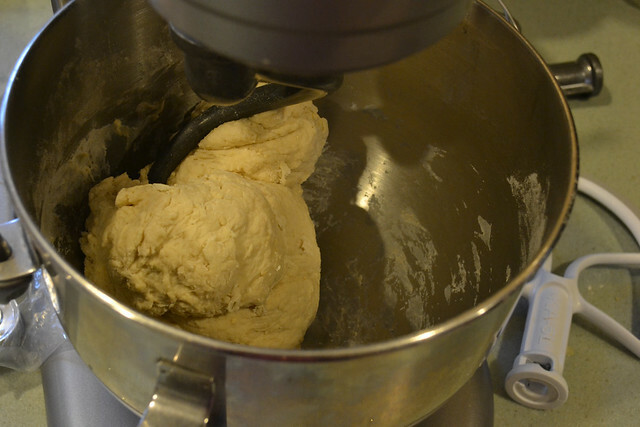 The dough went around on the dough hook pretty well, and held together easily. 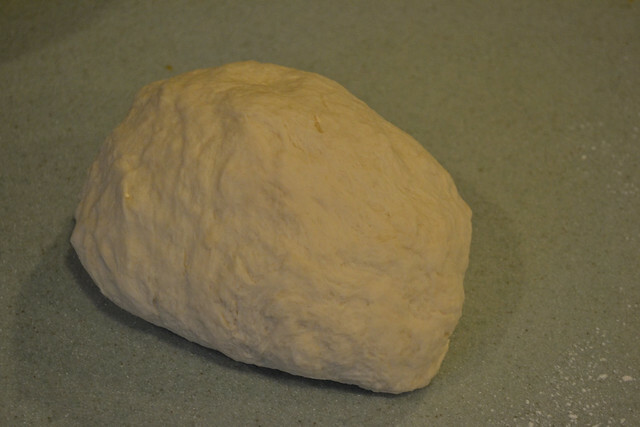 I did take it off the dough hook perhaps a bit early. 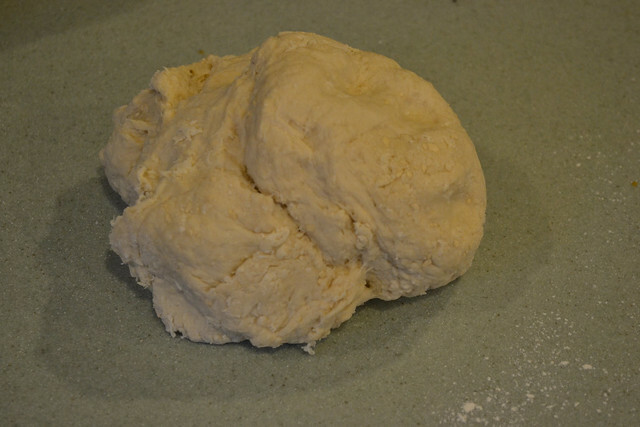 I had to knead a bit by hand, but the texture came out pretty smooth. 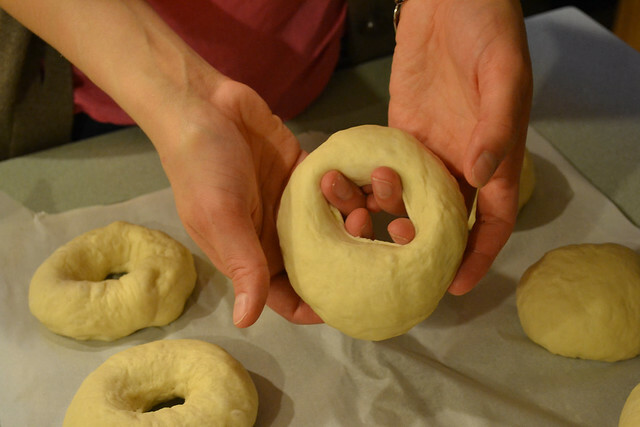 There are several methods out there for making bagels. Most include rolling out long strands and pinching them together. 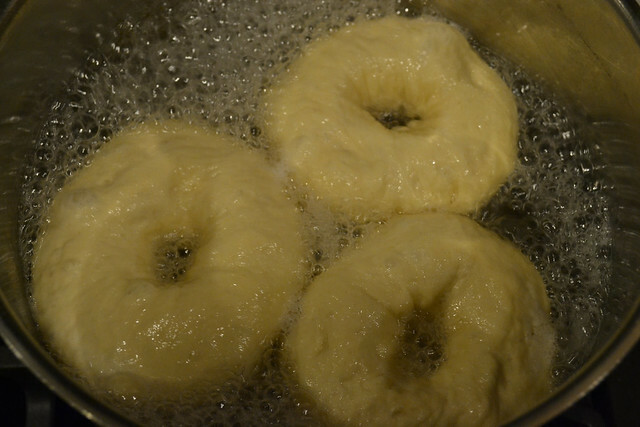 I've done this before, but my bagels almost ALWAYS come apart in the boiling process. I like King Arthur's method better... roll out "rolls" and let rest for a half hour. When the half hour is nearly up, I put the water with sugar and malt powder on to boil (love my power boil on the new stove!). 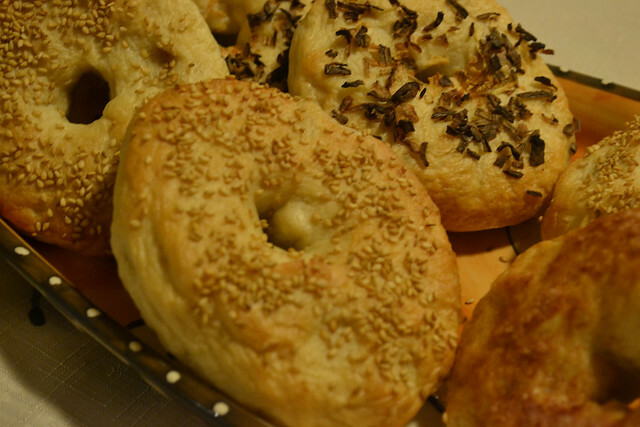 Then I poked holes into each of the bagels (carefully!) and let rest another ten minutes. The boiling process is fun, but a bit scary. I also found it very interesting to see the variety of all the different boiling times. Some recipes say 30 seconds per side. Others 2 minutes each side. This recipe said 2 minutes on side one and 1 minute on side two. That's what I did. We topped with cinnamon sugar (yum! 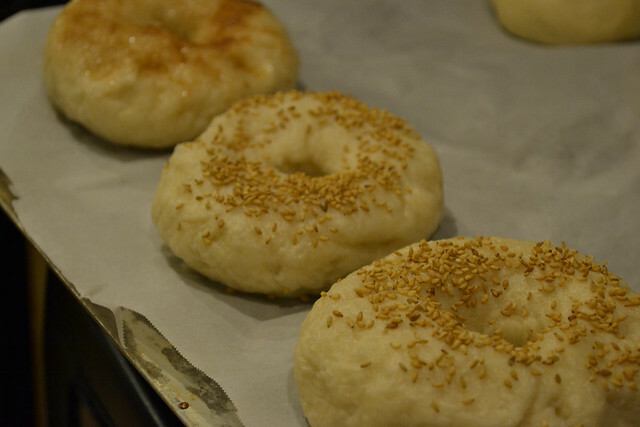 ), sesame seeds, and onion flakes. The onion flakes got a bit burnt, so I'm not sure if powder might have been a better option. We would definitely do poppy seeds in the future, but we were out this time. Also, sea salt or parmesan cheese are great options! It was hard to keep The Hazz from eating the entire plate. 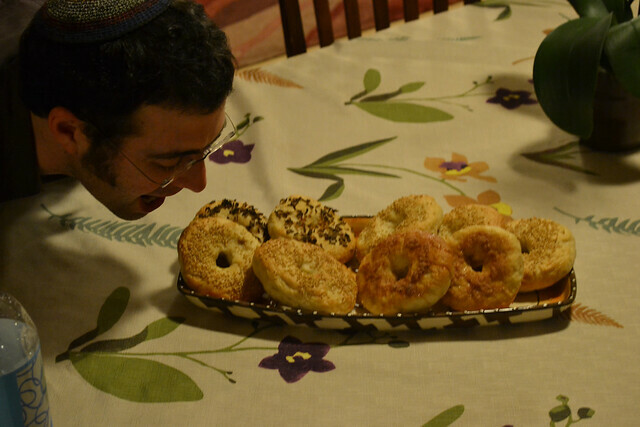 What did YOU do to celebrate the return of Hametz to your Post-Passover selves? Thank you for sharing this post. 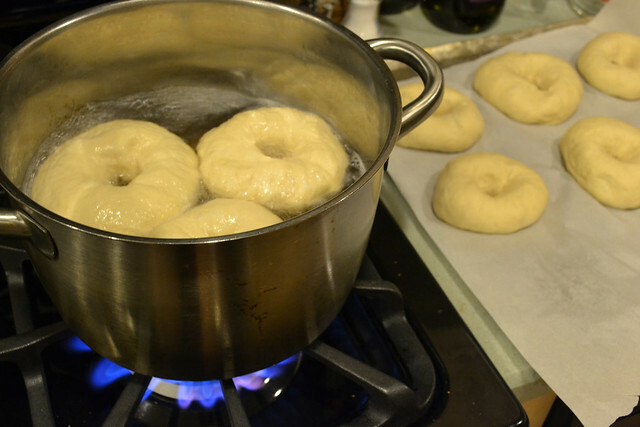 It is not just the boiling time that many recipes for bagels differ. Some would also suggest soaking it in hot water, others in cold, and not boiling it. 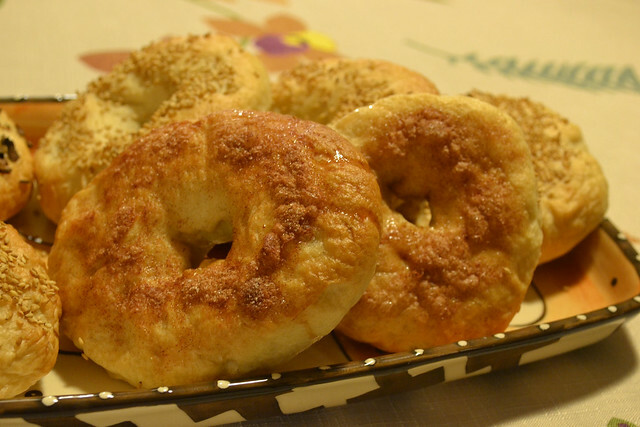 I guess this difference is also great so that we may be able to taste a variety of bagels, which are also available at catering Fort Lauderdale events and diners. Thank you for sharing this. I also like your idea of the different toppings! That is the yummy meal for me and I always bought it from bakery and eat my full. When I come on this blog and saw about these yummy things. I felt hungry. Kindly stop it :) and get the full working games on Road To Gaming for full version working pc games. I like your post this is so delicious and yummy .i felt hungry. cyberlink power dvd is the most number one media player and movie players. Furthermore, this software is the highest quality most immersive media entertainment experience. Most of all, this software brings this award-winning experience to your screen TV. Wow its nice and wonderful begals i love to see a new design here many people work in different ways, but i love this style . Thanks what a wonderful information. I found it very useful. I was searching on ACC 485 Week 1 Discussions Latest-GCU and suddenly i found this which is very use full. Great article and information keep sharing more! Love yours blogs. Thanks once again. Decent and delicious cooking world, keep it up good work. This also helped me a lot on ACC 664 Grand Canyon Week 5 Complete Work I used visit frequently and take the sweet recipe from your blog. Bundle of Thanks such great baking recipe. .AMMAR29..I like your post this is so delicious and yummy . Thanks for my share it. that’s what I was looking for, what a material!present here at this webpage, thanks admin of this web site. Nice Information. Keep Sharing More LOVE!! What a nice post and nodoubt explained beautifuly.Thank you for such a wonderful article and sharing with all of us. God bless you and keep it the up the good work.! Really amazing recipes and nice cooking ideas. Wonderful blog with lot of information. You can get GTA IV Free download full version for PC 100% working link. I love this post because I am foodie. It was really nice recipe and I would like to try it at my home. I gotta favorite this ԝebsite it seems extremely hlpful very useful. one of the best article that you have shared with us. for more details must visit my site. Good man I know you have put a lot of effort on it. What’s up everybody, here every one is sharing these kinds of familiarity, thus it’s nice to read this webpage, and I used to visit this website daily. Interesting information about how can i meld chocolate and how can i make pizza and cake base. Nice post. Looking for Latest game then check Pubg game for pc full version freeonly on one click. Interesting website you designed with the creative content keep it up your hardwork dear.